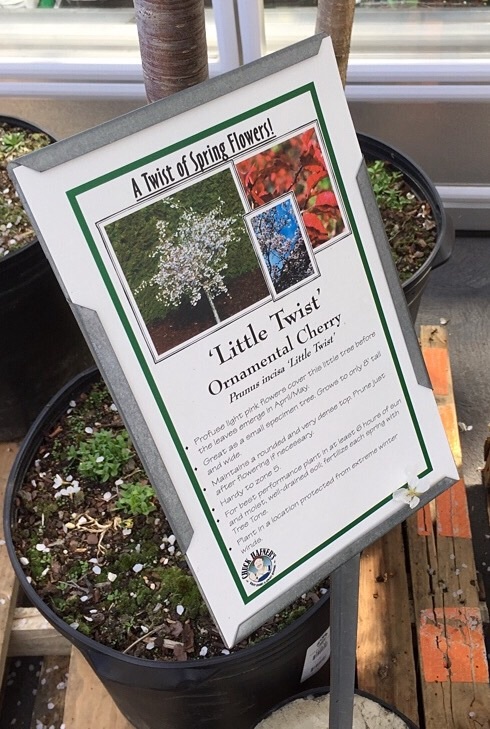 A cherry tree will be going into the backyard of the Little Bitty in the Syracuse city neighborhood of Eastwood. 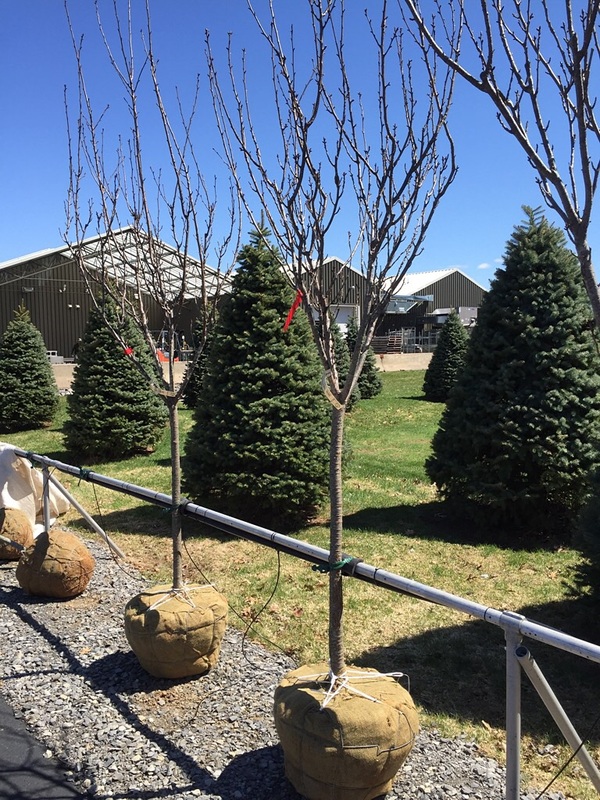 My dear wife Karen and I took the trip to Chuck Hafner’s Garden Center in North Syracuse this past weekend, walking the aisles under the sun out back and inside the greenhouses, too. We spied the varieties of blossom-producers, looking them over with hopeful and judging eyes. We read their tags and pictured them at full height and width at that spot in front of the backyard fence separating our yard from Good Neighbor Tim and his Wonderful Wife Lorraine’s plot. We looked at how tall they are now and compared that to length of the Mazda CX5. Price came into play. These babies are expensive. Try north of $200. And the whole 25 feet. The first group we ran into stood tall, probably too. 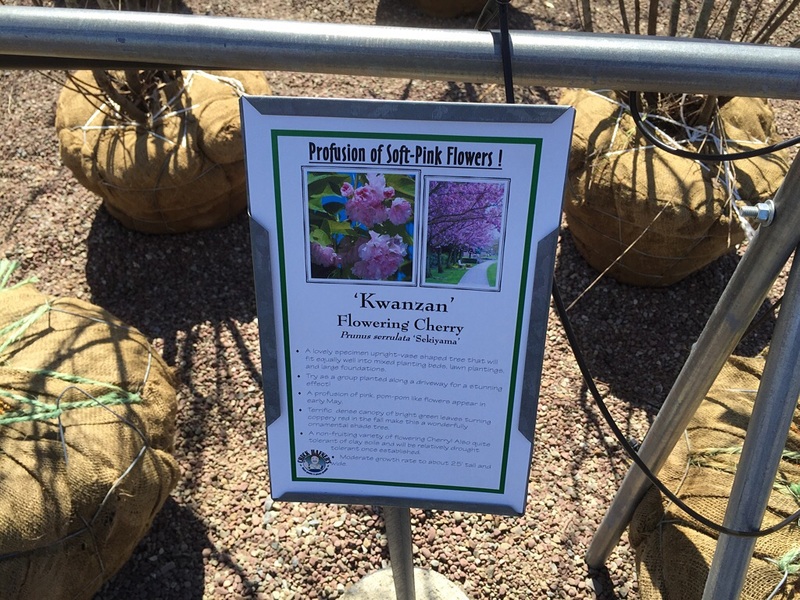 The “profusion of soft-pink flowers” sounded wonderful, but I thought I’d have to call around to find somebody with a pick-up truck to help me bring one of these babies home. I also thought it would grow too high and wide for our Little Bitty backyard. The photo on the sign truly did help keep it in the running nevertheless. 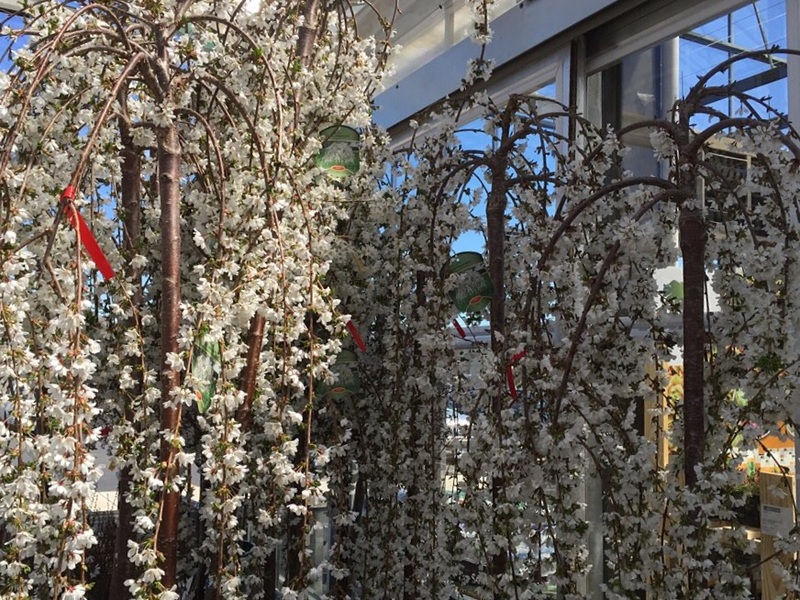 And our Easter Weekend getaway to Washington, D.C., and the walk around the Tidal Basin to spot many beginning-to-bloom trees during the Cherry Blossom Festival became part of my mental calculations, too, when we spotted a field of white that revealed these weepers. I thought of Karen and a group of women amid white across a road when we strayed on the way toward the Jefferson Memorial. Nice. But these, listed at six- to eight-feet maximum, would never grow that high. Not even close. Ron Burgandy has a genus! Wait, Royal. On the other side sat one more stand of cherry, this reading Burgundy Royal, looking promising to me for its vivid color, of blossom and leaves before they wave goodbye in fall. Also, I’d call these medium-sized at full maturity. Me likey. Screw up my courage for pinkish-white? The fence cut winds but collects water, for 50-50. 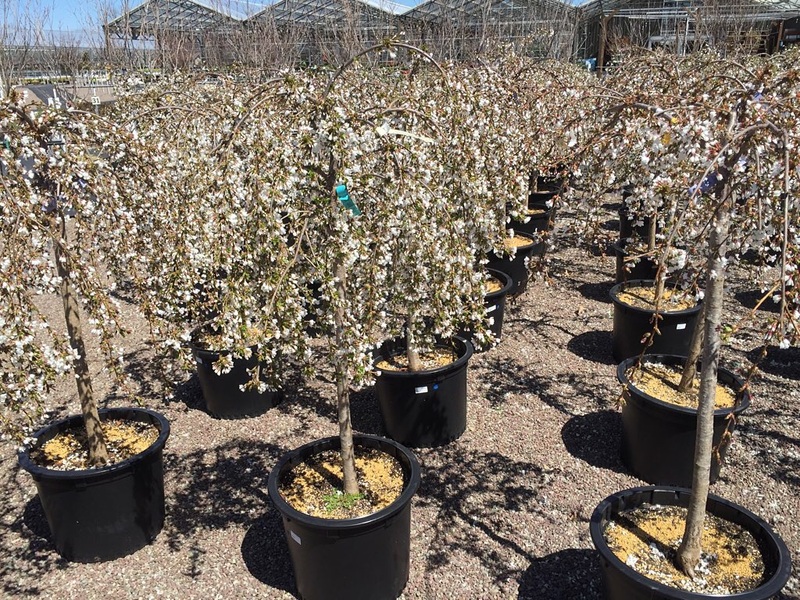 On the way inside, the first of two greenhouses before reaching the store proper included a batch of cherry trees stored in the wayback. Karen spotted them right off. I picked up the red tags designating that they’d been sold. The Little Twist combined pink and white, to my eyes, and had a top-heavy shape without any weeping. Perfect name for Syracuse, the Snow Fountain. Get my drift on the cool shape? White blossoms. Weeping shape. Full height, eight to 15 feet, over the top of the fence, but not over the top of our Little Bitty sensibility. (That’s in satisfying contrast to the mini Snow Fountains we spotted outside, I note.) Full width, six to eight feet, wouldn’t overwhelm the whole side of the yard. Zone 5, hardy to 20º below F.
Winner, winner, chicken dinner. We think. Of course, all of these had been tagged as sold. We’ll have to call and see if the good folks at Hafner’s have more to sell us in the next few weeks. 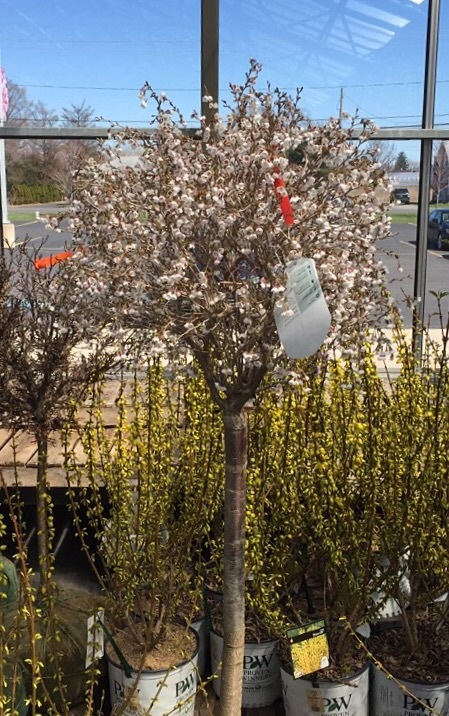 Would you pick a different type tree that blossomed for a longer period of time, and if so, which species? Would you go for a true fruit-bearing tree, and if so, which one? Which of the cherry trees do you like best, and why? Life is just a bowl of cherries and your post is much more than just a bunch of cherry trees, Mark. I’m bowled over by all the blossoming here. Cherry trees are lovely. I remember one in the back yard as a kid. Harvest time meant a lot of stooping and gathering, but also cherry pies! Yay. Good luck and good planting. I live in a wooded area, so I’d be inclined to choose actual fruiting trees for the back 40 and somethin dwarf for the yard. Tree maintenance is no fun, and costs a lot to have someone else come to prune. We’ve got two apple trees to fuss over already. It is a looker, that Burgundy Royal, Joey. But we favor the small ones because of the small yard and the pruning issues, as you so rightly point out. You have a back 40! That’s great for you, as that reminds me about your goals for hubby and you to reap the harvest. Yay!! 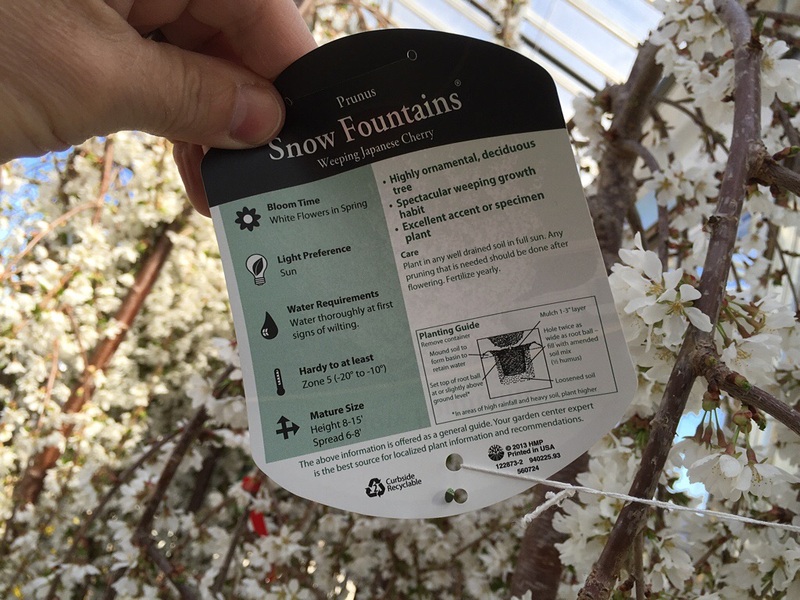 Yeah, we don’t want it spreading little cherry trees all over the neighborhood, do we, Austin? Wow, who knew there were so many types? Very interesting Mark. So many, Paul. Life is full of choices every day. Thanks, my friend. Your story reminds me of when we went to our garden store to purchase a tree because our yard didn’t have enough. We opted for a pear tree because (1) I like pears and pictured picking them an canning them, and giving really fresh fruit to my then young children, and (2) everyone has apples trees, but I didn’t see a lot of pear trees around. The tree as its benefits and drawbacks. Yes, the fruit is wonderful, except that we can only reach the pears on the lower branches – the squirrels get all the good ones. And when those pears fall? You do not want to be under that tree at the time, and you do not want to be the one in charge of picking up hundreds of rotting pears from the back yard. However, it is amusing at the end of the season when the pears start to ferment, and the squirrels all get tipsy. That’s a lot of work and warnings, CM. I immediately was turned off by the signs that proclaimed how certain fruit trees needed mates to make sure they would indeed be pollenated and fruited. I don’t want the sort of labor. Those trees manage to get pollinated somehow. Nature! Thanks, CM. Going over to check it out now. Oh so many choices!!!! We had the same situation when choosing a mesquit out here. So many to choose from!! I think your choice is perfect and now the hunt is on to get it home! The chase is half the thrill, they say? I say it’s half the work. Then the digging. Thanks, Nancy! Since I practically grew up in the woods, it’s hard for me to embrace the concept of paying for a tree. But I fear that day is coming for me as well. Good luck getting the one you want. Your weeping cherry tree is beautiful, Mark. In Chicago, growing up, some streets were lined with crabapple trees that, to me, had a lot of the beauty of the cherry trees in Washington. When I moved to L.A. and bought a house, I wanted a beautiful spring tree like that, but the heat here overwhelms most of those trees in most areas of the city. Nonetheless, I was able to find an ornamental crabapple that hung in there for us. If not a perfect pink profusion, we had an artful pink scattering of blooms about its branches every spring. The apples, reduced in size even further by our unkind climate, stayed on the tree to Christmas looking like cheery cherries against the black bark. After that, they made handy missiles for growing boys. All around, a most satisfactory tree planting. Good hardy trees for you specifically because of your arbor ardor no doubt, Babe. We have a flowering Robinson crabapple we put in two springs ago on our front lawn that is doing quite well. Knock on wood! It looked great last spring a few weeks later than this, grew since, and has buds now! 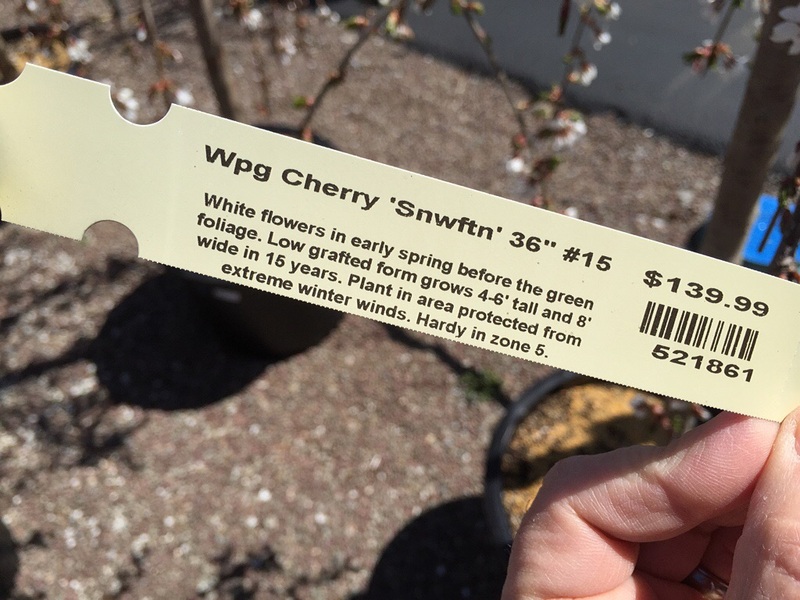 I was just asking my husband if he thought a cherry tree could survive in southern manitoba they are so beautiful. They all said Zone 5, Donna, down to minus 20º F. You can google, but I have a feeling southern Manitoba may be Zone 4? Yeah darn i guess it will be pixs for me. Hmmm maybe get one full size pic and put up in yard. We are leaning toward the ornamental rather than the fruit-bearing, Diana, because of the size factor of the Little Bitty yard, Diana. 🙂 Thank you, my friend. ❤ Calgary, I don't know about the cold when there's no Chinook winds. no cherries? Your reasoning makes sense though. We have a short growing season and the ground freezes quite deep in the winter. Although this past winter, I think banana trees would have survived! Oh gosh, well truly a valiant effort. We need to be planting more trees and those just seem like really beautiful ones, never mind the fact that they might produce some tasty fruit. Do you need to do anything special so they cultivate edible fruit? I think I’d have an avocado tree. They’re really popular here in L.A. I love avocados. Chocolate, California and avocados…I have a feeling Karen and I would have a lot to talk about! Oh, and before I forget, that fake band picture I told you about is coming up tomorrow. ❤ Thank you, thank you, for your inspiration on that one. 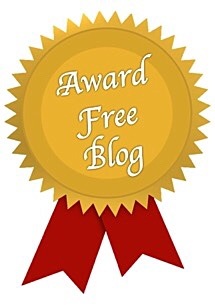 You’re welcome…and can’t wait to see it! Hope, hope, hope, Rachel. Knock on wood. Thanks, Roy. If we can get one in our ground, I can’t wait to see it a year from now! Every tree is beautiful, but one that grows fruit is a win-win! They are quite attractive trees, Me Who, that they are. Nope. Would’ve chosen the same as you and Karen. Lovely. Love a weeper tree. Very nice. Thanks, Red. The weeper will amaze us yearly, if things go right! Oh why must I pick just one???? I shall pick them all !!!! Ruh roh……. 🙂 You will be very popular and loved when they bloom. Sorry about the debt buddy. How about every other one? Is that better? 😉 You’re welcome Shaggy MBM. ❤ I knew you would love it. And glad the halving was a relief. Oh, man. Who knew picking out a tree would be so difficult. So many things to consider. Actually, I did kind of know this because Mr. B’s brother (the one who I had to return the Christmas tree to back when) manages a nursery and we cannot even buy a weed without consulting with him first. 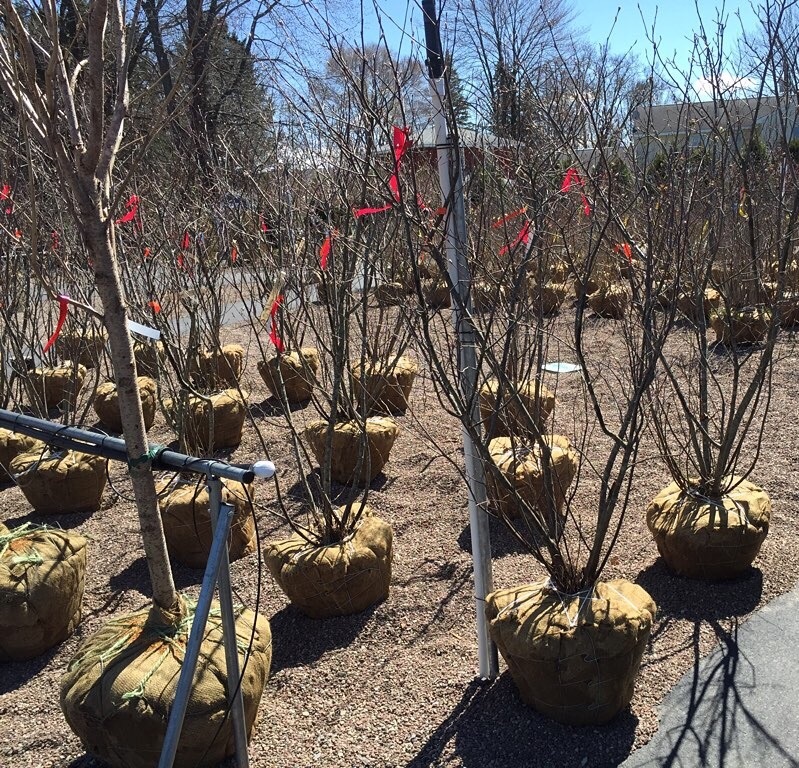 He’s gotten us some nice birches which I love but I share your enthusiasm for the cherry trees. Especially after you having visited DC. They are so beautiful. I hope the store gets more of Snow Fountains soon. I can imagine how busy a good person in that business is at this time of the year. 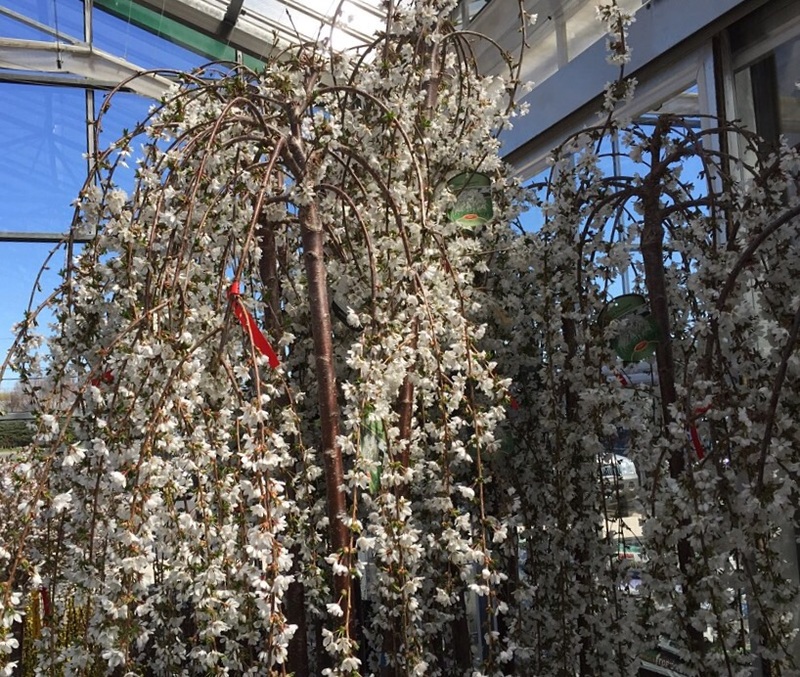 Crazy, Mrs. B.
i love the weeping cherry and i’m all about the beauty and form, even if it’s for a short time. enjoy ! Weeping with joy when it’s blooming, we will be, Beth. Thanks. I love the cherry bro Mark. And my favorite scented soap is cherry blossom, so that’s a definite for me. 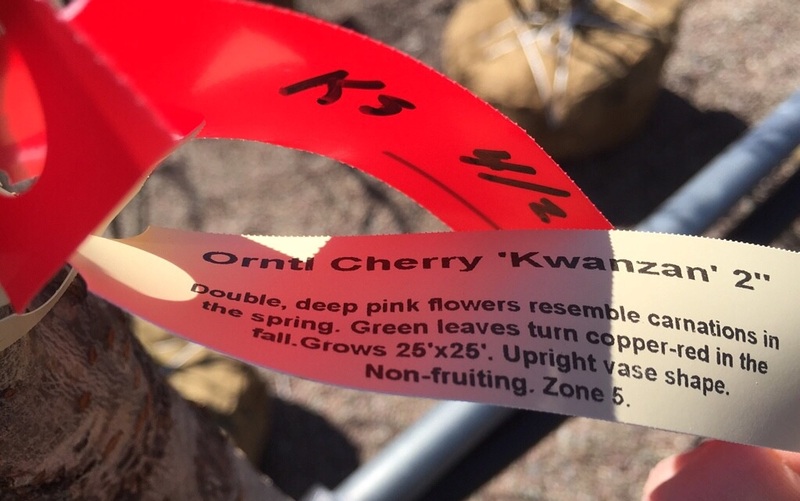 Of course, being me, I would also plant a fruit bearing cherry tree, just in case G. Washington should pass by with his ax, or, barring that, because I love cherries. And sour cherries are really good for pain control, gout, and a large number of other ailments, so tuck one away in the back, keep it covered with fine mesh so the birds won’t eat the fruit, and send all excess fruit to me, cause I know what to do with it. Your blog is hard to find lately brother. Sorry you can’t find me, sis Angie. I feel like I’m in the same spot. You probably are bro Mark, but I start reading from the top, and I start late in the day. Must be following too many people. I’ll rectify that, and try the reader in the morning instead of late afternoon. That just might help. I post at 7 a.m. every day, sis Angie. Sorry. I’ll start reading earlier bro Mark. If I sleep at night at all, I’m always awake by 4 a.m. so by 7 my day is half over. Thought you might like to know that the ad running below this post was “Intimacy Tips” from KY Jelly. Not kidding, pal. I’m sure that ties into a cherry tree somehow but I need to think about it. I like the one you liked. The one that looks like a weeping cherry tree. Beautiful! Thanks, P.J. We are going to try to buy one of these in a week or so. Very exciting. That’s great! It was beautiful! We have to do some more scrambling and planning, Rachel.